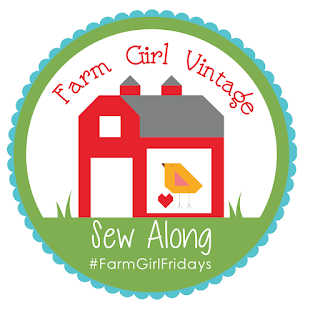 Today is my turn on the Farm Girl Vintage Sew Along blog hop hosted by the Fatquarter Shop and Lori Holt, using Lori's book, Farm Girl Vintage. My block is the Spring Star Block found on page 62 of the Farm Girl Vintage book. Lori does a great job of explaining each step resulting in a win every time! The hardest part about this block was picking out the fabrics. 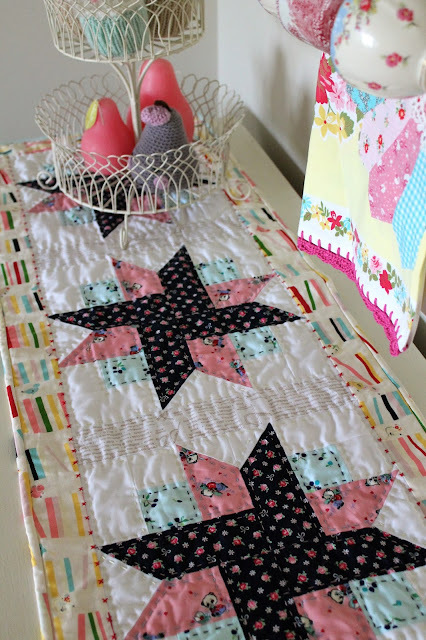 I had a lot of fun making a table runner for my dining room using this Spring Star Block, great fabrics and hand quilting. 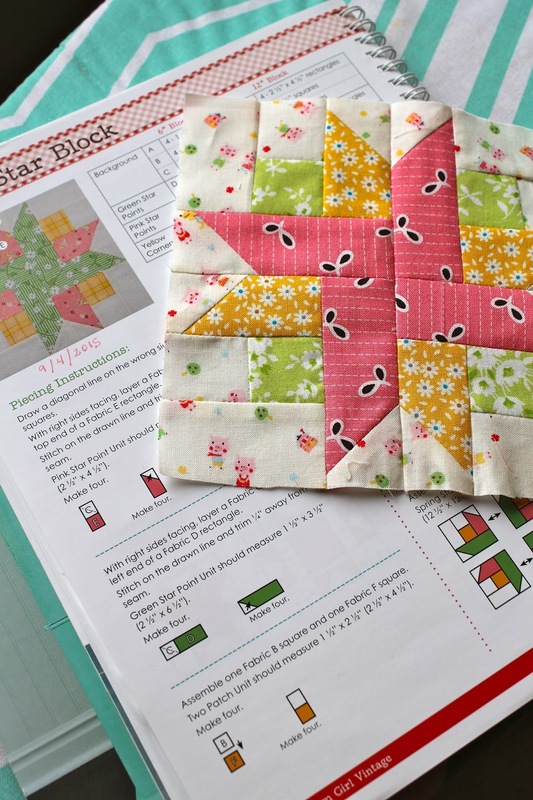 Lori has lots of patterns in the book using her gorgeous blocks. Be sure to check out the other bloggers on the schedule for more inspiration. It's never too late to join in the fun! 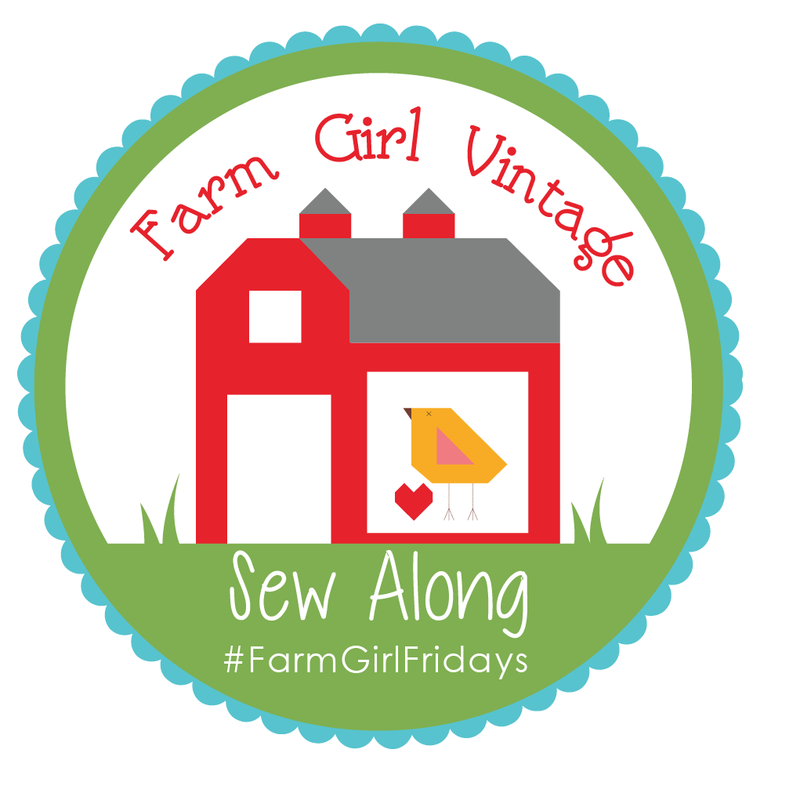 To help you get started I am giving away a copy of Lori's book, Farm Girl Vintage! To enter leave your email address in the comments and a winner will be chosen at midnight on Sunday, September 6. International friends are welcome to enter! 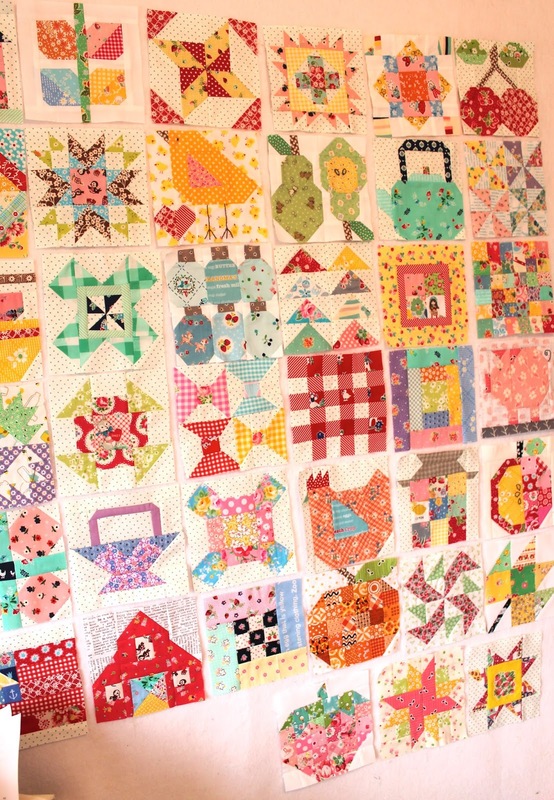 A big thank you to Lori Holt and the Fatquarter Shop for hosting sun a fun sew along! I already have the book, I haven't actually gotten around to making anything yet, but some day! Your block is so pretty, I love the colors! Love the blocks in the book! Please enter me in the drawing. Thank you! I love your block and this book. I have made the tractor block into a pillow with a pocket for little animals for my grandson. I would love to pay it forward to Deb from the birthday group if I win. Is that legal? Love that block and the sweet quilting!!!!!! I've been waiting for your turn. So pretty. Now I want to play catch up today. I'm about six blocks behind. Yikes, how did that happen? How pretty! Your hand quilting makes it really pop. HI, very nice runner! Thanks for the giveaway! You may have had a hard time picking out your fabrics, but I ADORE them! Great job! I loved the runner, such beautiful fabric. I would love the chance to win the giveaway. 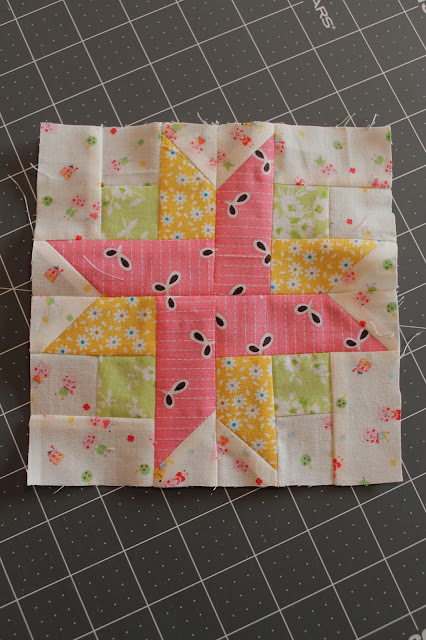 That's a very cute block and your runner turned out great! Thanks for the chance to win. Thanks for the chance to win. I love the colors you chose for your block. What a wonderful giveaway! This book is a treasure!! 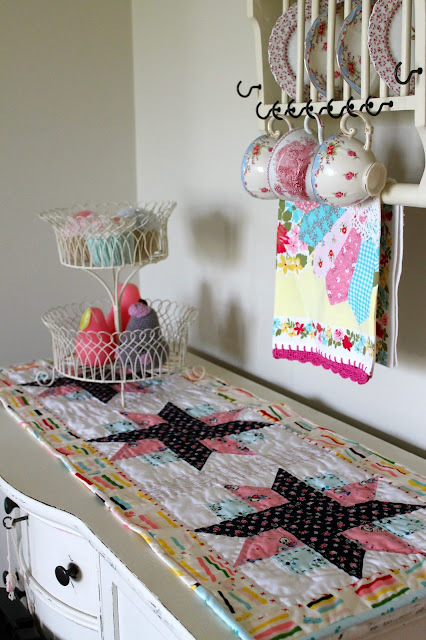 Love your blocks and the beautiful table runner you made! Wonderful giveaway of a wonderful book! OMG!! I love your table runner!! The fabrics you chose were fabulous together! I would LOVE an entire quilt using those. 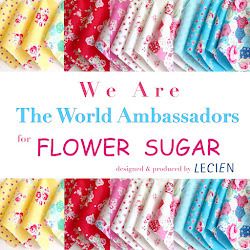 Thanks for the opportunity to win Lori's book. 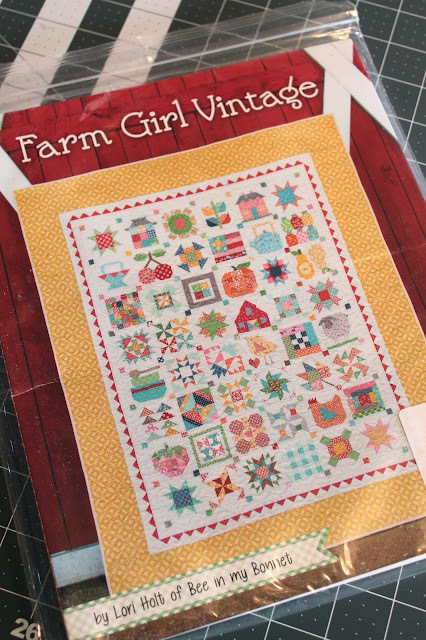 I have seen so many wonderful blocks from this book and each one makes me want to sew along...just need the book! My husband grew up on a farm, so I'm close to being a farmer's wife! Your project is so cute! I love it! Your table runner is beautiful! I just love the black print in there; it really pops. Thanks for the chance to win. I love how you chose the pink fabric to highlight the center of this block. It is a simple block, but looks amazing when completed. Your table runner looks really nice on that chest. 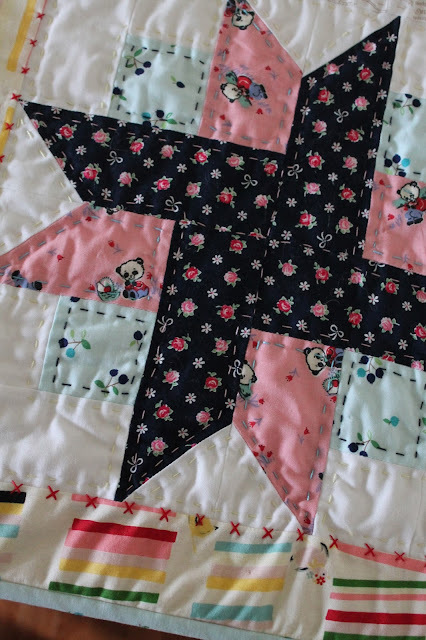 Great job on hand quilting!